Ford CEO Jim Hackett faces unhappy investors after announcing fourth-quarter losses from 2018, Carlos Ghosn is officially out at Renault, the Apple Car program—did you know that still existed? I had forgotten—slashes employees and much more for The Morning Shift of Thursday, Jan. 24, 2019. I think it’s safe to say that the traditional American automakers have had an adversarial relationship with Wall Street in recent years. Despite continued strong sales after the recession and growth in China (though both are slowing down as of late) our moneyed investor class isn’t convinced that General Motors, Ford and the rest are moving fast enough, or are prepared enough for our electro-autonomous-mobility future, or can weather another economic downturn. Ford’s latest CEO Jim Hackett was tasked with turning its stock price around. But his path to change hit a bump in the road yesterday with the announcement of the automaker’s 2018 end-of-year financial results. Ford posted its first quarterly loss in two years and a net yearly profit that was only about half of what it was in 2017. This led Hackett and other executives to do the “we’re very sorry but we’re definitely working on this” dance before investors, who continue to be unhappy with Ford. So what happened? Not surprisingly, it was a lot of things. Tariffs on metals and higher commodity costs were one factor. Weak performance in just about every market except North America was another; Ford lost $2.2 billion across the world, including Asia, Europe and South America. “We don’t have the F-Series profitability in all of those markets,” Hackett said. Spending on mobility services and recalls also factored in. So, let’s turn to China. Obviously, China is the largest automotive market in the world and we think it could be twice the size of the U.S. by 2025. So getting our business back on track is essential, given our plan to grow both brands in China. Last year, as we discussed with you, we identified a number of operating shortfalls, including inadequate dealer profitability. We had excess stock, especially of our high-volume C cars. These deficits were exacerbated by the fact that we had not maintained a fresh lineup. In fact, all of our volume cars were in sell-down last year. Also, our structural costs were not aligned with our volume and we lacked a strong bench of local leadership. Ford has a lot of work to do, across a lot of different areas. I don’t envy them here. Hackett, 63, was more blunt than he’s ever been in the 20 months since he became CEO about what has ailed Ford. He described how its product development had been “constipated” days after taking the wraps off a new Explorer SUV that hadn’t been redesigned in almost a decade. And he painted a picture of a company that allowed costs to creep up under his two predecessors. From 2013 to 2017 — a period coinciding with the last years of Alan Mulally’s tenure and the abbreviated reign of Mark Fields — Ford’s structural costs grew by an average of about $1.7 billion annually, Hackett said. 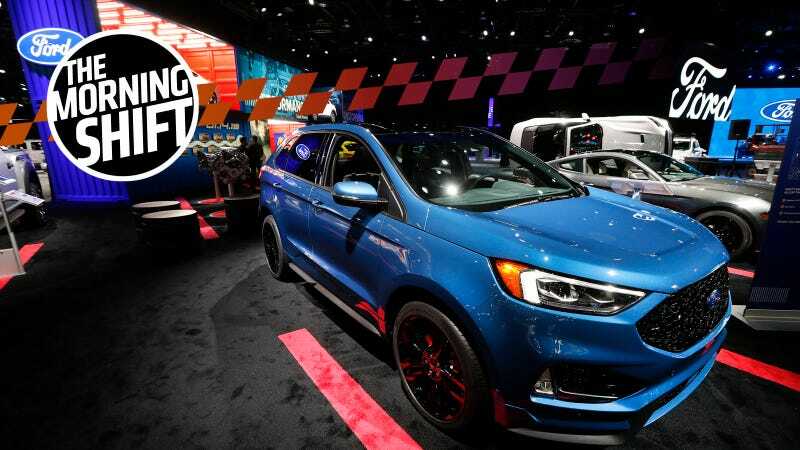 Ford “arrested” this trend last year and will keep structural expenses flat in 2019, the CEO said on a conference call with analysts. It can move more quickly now to bring fresh SUVs, crossovers, pickup trucks and other new models to market. Again, Ford has a lot of work to do. Whether he’s convicted of financial crimes in Japan or not, Carlos Ghosn is done in the world of cars. The fallen leader of the Nissan-Renault-Mitsubishi alliance, who until late last year was one of the most powerful businessmen in the world, officially resigned as chairman and CEO of Renault last night. He had already been ousted at Nissan, which accused him of underreporting his income and misusing company funds. The 64-year-old resigned as chairman and CEO of the French automaker late on Wednesday, French Finance Minister Bruno Le Maire told Bloomberg TV in an interview on Thursday. Ghosn is set to be replaced as chairman by Michelin chief Jean-Dominique Senard, and as CEO by Thierry Bollore, who has been filling in on an interim basis. It’s a turnabout few would have predicted before Nov. 19, when police swept aboard Ghosn’s private jet shortly after it touched down at Haneda airport. He’s been in custody ever since, accused of financial misdeeds at Nissan that include understating his income by tens of millions of dollars and transferring personal trading losses to the company. If convicted, he could face decades in jail. Ghosn has denied wrongdoing. You ever stop to think how crazy this all is, how unfathomable it would have sounded even a year ago? Well, that’s reassuring. So basically Nissan and Renault will be those two parents who sleep in separate bedrooms and are largely together for the kids while they’re in school. I don’t know where Mitsubishi figures into all this. Probably staying in the guest house, or crashing on the couch. Our news cycle moves so quickly—even in the world of cars and mobility—that approximately 250 years ago (it was 2014 to 2016) Apple was said to be working on a car. Project Titan, they called it. We all knew next to nothing about it, but we knew it’d be a big deal, because this was Apple and everything Apple does is a big deal, and thus the car would be poised to be a major disruptor, even though Apple’s not nearly as grand as it used to be. Motor Trend even did a whole thing on it. It was, predictably, bad. Despite going on an aggressive hiring spree as it poached engineers from across the auto and tech industries, by fall of 2016 Project Titan was said to be in total disarray, marred by rising costs and internal arguments over its direction. As we say around here, making cars is hard. Last we heard, Project Titan pivoted away from a physical, actual car to something like an autonomous software platform it could license to other companies. The story notes that last year Apple poached longtime Tesla executive and former Elon Musk lieutenant Doug Field to lead Project Titan. These layoffs are seen as restructuring under the new regime. CEO Tim Cook has been touting Apple’s initiatives in health as the key to its future. “I believe, if you zoom out into the future, and you look back, and you ask the question, ‘What was Apple’s greatest contribution to mankind?’ it will be about health,” Cook told CNBC’s Jim Cramer. Interesting. But this isn’t a tech blog, so back to the cars. Speaking of Tesla, it’s in a kind of crunch mode again, though it doesn’t feel as precarious as anything in 2018. The automaker is cutting back staff while aiming to increase production as it takes the Model 3 to Europe for the first time and begins work on an ambitious plant in China. It also needs to really get moving on that long-promised cheaper Model 3, with the $7,500 electric vehicle tax credit going away. My guess is the focus is on Model 3 from here on out, and on the margins that the more expensive Model S and X can bring in. Neutral: What Does Ford Need To Do? You awake in a cold sweat this morning in a mansion in Dearborn. You walk to the bathroom to splash some water on your face, only to be met with an entirely new face in the mirror. The shock eventually subsides as you come to terms with your new reality: Your old life is gone, and you are now Jim Hackett, CEO of the Ford Motor Company.